In 4-quart Dutch oven, cook beef, onion and bell pepper over medium-high heat 5 to 7 minutes, stirring occasionally, until beef is thoroughly cooked; drain. Stir in hot water, sauce mix (from Hamburger Helper box), chili powder, garlic salt and tomatoes. Heat to boiling, stirring occasionally. Reduce heat; cover and simmer 5 minutes, stirring occasionally. Stir in uncooked pasta (from Hamburger Helper box), corn and olives. Cover; cook 10 minutes longer. 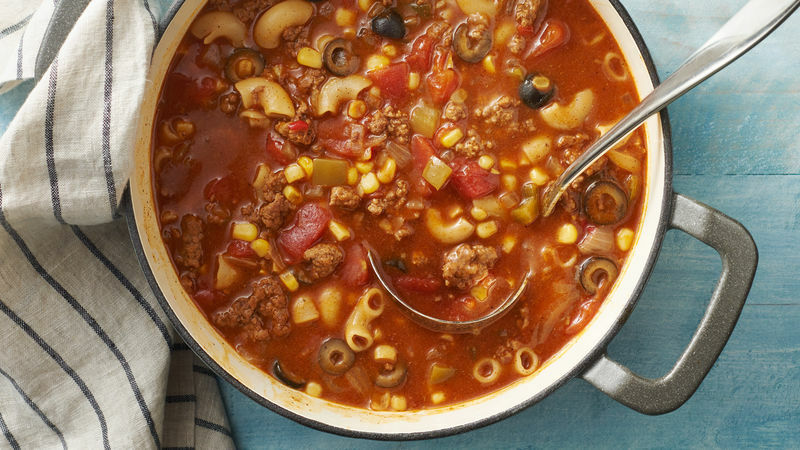 Ladle this soup over a mound of corn chips and shredded taco cheese, or sprinkle each serving of soup with corn chips or coarsely crushed tortilla chips.